25 Years in the Rearview Mirror: 52 Authors Look Back is available in e-book format from the below retailers and is FREE for a limited time. Smashwords – Smashwords offers books in formats compatible with Kindle, Nook, iPad, phones, computers, and more. For information on how to download a Smashwords book onto your device, visit this link. 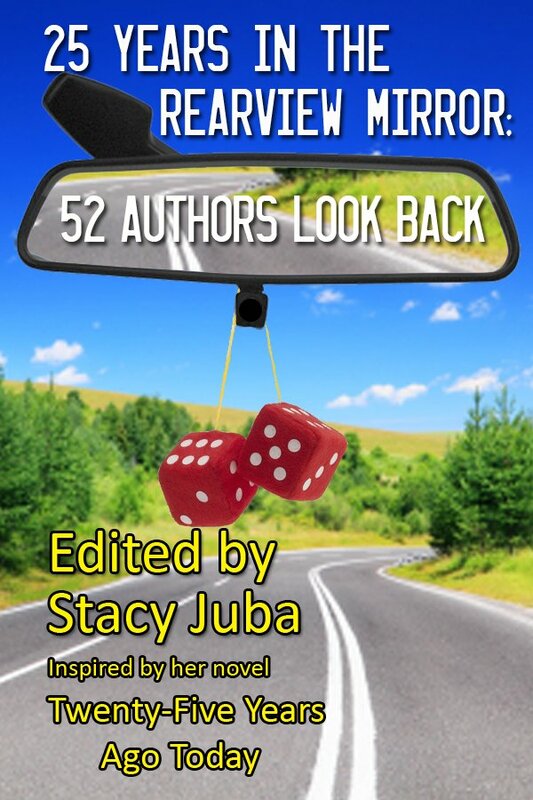 25 Years in The Rearview Mirror: 52 Authors Look Back is the perfect book to enjoy over your morning coffee. This collection of poignant and uplifting essays will warm your heart, raise your spirits, and compel you to examine your own life. As a tie-in to her bestselling mystery and romance suspense book Twenty-Five Years Ago Today, novelist and award-winning journalist Stacy Juba invited her author colleagues to answer the question “What were you doing 25 years ago?” Meet Lieutenant Pink Shoes, the mysterious Red Man and a singing telegram; find out who got suspended from school, who almost missed the prom and who was the oldest campus editor; discover anecdotes of lasting romance, not-so-lasting love and raising a family; be riveted to real-life tales of a hurricane, fire and tsunami; gain insight into the writing journey of today’s top authors; and find out what makes your favorite characters tick. Includes a special bonus for Twenty-Five Years Ago Today fans – find out what Diana Ferguson was doing on the last day of her life! 25 Years in the Rearview Mirror: 52 Authors Look Back was inspired by the novel Twenty-Five Years Ago Today, a unique blend of mystery, romantic suspense and literary mystery. This 30,000-word book will help readers to discover new authors for their to-read list, and inspire them to reflect upon the small defining moments that have shaped their own lives. Includes a foreword by Elaine Raco Chase, award-winning author of seventeen paperback novels with over 3 million books in print. Publishing credits of the contributing writers include New York Times bestselling, USA Today bestselling, and recipients of the Romantic Times Lifetime Achievement Award, Minotaur Books/Mystery Writers of America First Crime Novel Award, Mississippi Author Award, Benjamin Franklin Award, and Eppie Award, as well as nominees of the Pushcart Prize, Agatha, and Shamus Awards, to name a few of the many honors. Each essay can be read in under five minutes. Twenty-Five Years Ago Today is also available as part of the Young Ladies of Mystery Boxed Set, which features three suspenseful novels in one download. Join the 25 Years in the Rearview Mirror Yahoo Group! Click the Join Group Button, choose the No-Mail option, and then browse around to download excerpts, stories, articles, book blurbs and more from the Rearview Mirror authors. This is not a discussion group and you won’t receive emails, but you need to click the Join Group button in order for Yahoo to allow you access to the free materials in our Authors’ Corner. We hope you’ll stop by.